Immerse yourself in the splendour of an original 1870s house  The Bourne Hall Country House Hotel  traditionally decorated with garlands, cinnamon bushels and holly. We depart from your home and travel south to Southampton for your crossing to the Isle of Wight. On arrival we continue to our hotel where you can enjoy tea and mince pies served in the drawing room on arrival. Immerse yourself in the splendour of the original 1870s features of the House traditionally decorated with Garlands, cinnamon bunches and holly. A drinks reception will welcome you before you take your seats for a candlelit three course dinner. After dinner relax with coffee and mints. Today you will get your bearings with a scenic tour around the south and west of the island with historic Yarmouth and picturesque Calbourne where we stop with time to walk into the village to see the famous beauty spot of Winkle Street. Tea and cakes will await your arrival back at Bourne Hall. A Mulled Wine Reception will precede a gala Christmas buffet. Take part in the Victorian Christmas quiz after dinner, with prizes. Relax with coffee and mints and enjoy the log fire in the drawing room. We visit Osborne House, one of the iconic destinations on the Isle of Wight and the summer residence of Queen Victoria. We enjoy a special festive tour of the ground floor and discover how Queen Victoria celebrated Christmas with her family. Enjoy an Isle of Wight beer and wine tasting reception prior to a festive dinner with all the trimmings this evening, following dinner there will be music and dancing until late. Please note - The dress code for this evening is smart. Today we visit the resorts of Ryde and the yachting centre of Cowes. Dinner this evening will be served in the Cameron restaurant whilst marvelling at the trickery of a table magician. Enjoy a farewell breakfast before we take the crossing back to the mainland and continue our journey home. 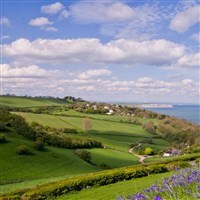 The hotel is a family owned and run hotel located on an elevated position at the foot of Luccombe Downs offering lovely coastal and countryside views. Originally built in the 1860s the hotel has 30 bedrooms and its public areas include bar/restaurant and lounge which are all charming and furnished with all the facilities that you would expect for a truly relaxing break. In additional to leisure facilities the hotel has an indoor & outdoor pool. Please note: Due to the historical nature of the building the hotel does not have a lift and it is necessary to negotiate steps to bedrooms and leisure facilities. The hotel has 3 ground floor rooms and these are strictly subject to availability. Travel south to Portsmouth your crossing to Isle of Wight, on arrival continue to our hotel where you can enjoy tea and mince pies served in the drawing room on arrival. Immerse yourself in the splendour of the original 1870's features of the 'House' traditionally decorated with Garlands, cinnamon bunches and holly. A drinks reception will welcome you before you take your seats for a candlelit three course dinner. After dinner relax with coffee and mints. Today you will get your bearings on the island during a scenic tour around the south and west of the island with historic Yarmouth and picturesque Calbourne where we stop with time to walk into the village to see the famous beauty spot of Winkle Street. Tea and cakes will await your arrival back at Bourne Hall. A 'Mulled Wine Reception' will precede a gala Christmas buffet. After dinner take part in the Victorian Christmas quiz after dinner with prizes. Relax with coffee and mints and enjoy the log fire in the drawing room. We visit Osborne House, one of the iconic destinations on the Isle of Wight and the summer residence of Queen Victoria. WE enjoy a special festive tour of the ground floor and discover how Queen Victoria celebrated Christmas with her family. Enjoy an Isle of Wight beer and wine tasting reception prior to a festive dinner with all the trimmings, following dinner there will be music and dancing until late - smart attire required. Today we visit the resorts of Ryde and the yachting centre of Cowes. Dinner this evening will be served in the Cameron restaurant whilst marveling at the trickery of a table magician. Rooms are allocated on a first come first served basis and are limited. The number of single rooms with No Single Supplement to pay is limited to our hotel allocation, and therefore additional cost may apply. Prices displayed are per person unless otherwise stated. Door to Door pick up may incur additional charges if out of area. Itineraries and hotel inclusions may be subject to change.